Wales and Denmark go head to head in a winner takes all bout in League B Group 4 of the UEFA Nations League. Wales are currently two points ahead of Denmark with this match being their last of the group stage, whilst Denmark still have a match against Ireland days after this Friday night showdown. If Wales win, they top the group and earn promotion to League A, whilst if Denmark win the same outcome. A draw would see it all come down to the Denmark vs Ireland match. Wales are priced at 13/8 and slight favourites for the match, as priced by SkyBet. The talisman is back for the Welsh in the form of Gareth Bale and he will be a nightmare for the Danish defence. He is deadly from all angles, distances and aerially and is priced at 7/2 to break the deadlock. Another player who has been a shining light in the eyes of Ryan Giggs is Derby County loanee Harry Wilson. He scored a crucial free kick against Ireland and is dangerous from outside the area. He is priced at 3/1 to score anytime. Wales shipped two goals in their trip to Denmark however looked strong in their most recent showing against Ireland. Denmark have some tricky forward players however it is likely Wales will line-up with five at the back. For the Welsh to keep a clean sheet is 6/4. Denmark are priced at a tempting 19/10 given the last result between these two. Much like their opponents, Denmark also have a leading player in Christian Eriksen. The Tottenham man is 13/2 to score first. Despite only playing two matches, they are yet to concede a goal and have a rock between the sticks with Kasper Schmeical. Denmark are 7/2 to win to nil. The referee for this match will be Slovakian Ivan Kružliak. 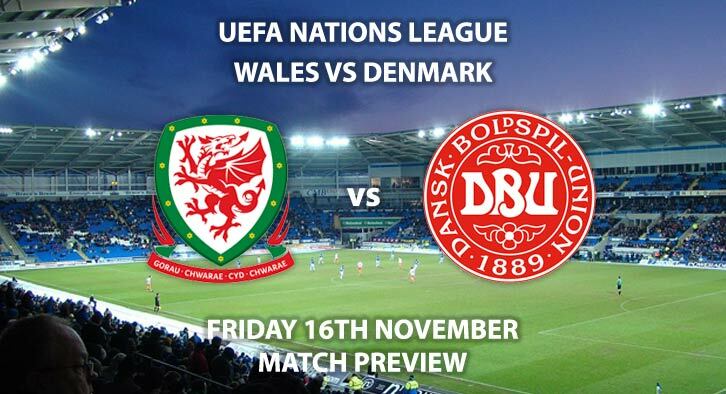 Wales vs Denmark will be televised on Sky Sports Football HD and kicks off at 19:45. – It should be a tight and tense affair. Gareth Bale could be the difference. Correct score: 1-0 Wales – 11/2. Wales to win 1-0, 2-0 or 2-1 – 9/4. Both teams to score in the 2nd half – 7/2. First Goalscorer – Gareth Bale – 7/2.